BRING 200 ml water with a pinch of salt to a boil in a medium-sized pan. ADD polenta when the water boils, mix well using a whisk. TURN down the heat and boil the polenta according to the instructions on the package. 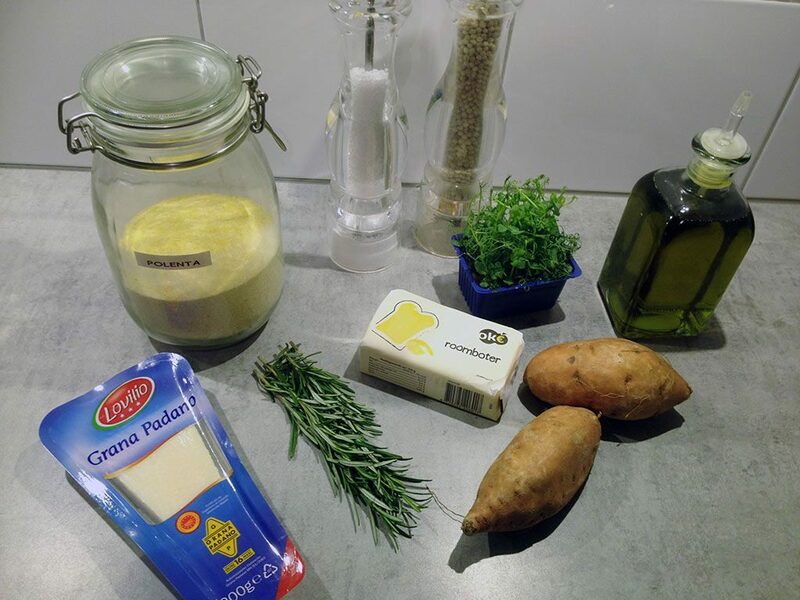 The exact cooking time can vary, seeing there are a lot of different kinds of polenta. The polenta used in this recipe took about 10 minutes to cook. The polenta will thicken while cooking, also bubbles will appear. This is supposed to happen! Keep stirring to prevent the polenta from burning. SEASON with butter, a large hand sliced rosemary, some grated parmesan cheese (not all of it!) and some salt and pepper. COVER the inside of a large square baking tray with a ridge with tin foil, then pour the polenta in it. MAKE sure to smooth out the top. WAIT until the polenta has been cooled off to room temperature before placing it for at least 2 hours in the refrigerator. YOU can afterwards slice the polenta into square shapes. PRE-HEAT the oven to a temperature of 180 degrees celsius or 350 degrees fahrenheit. PEEL the sweet potatoes and dice them. 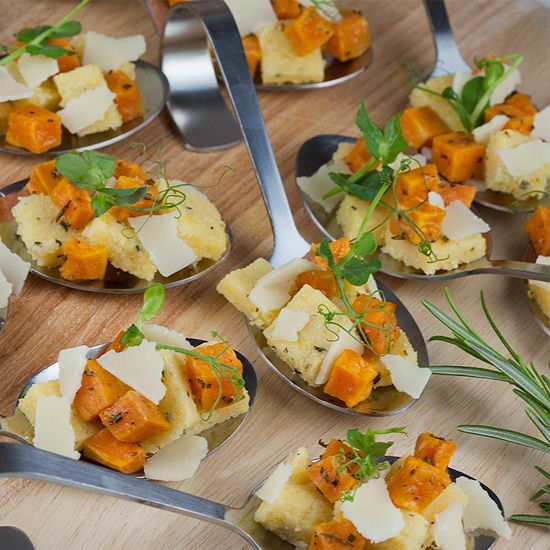 DIVIDE the diced sweet potato over an oven dish and sprinkle with a tablespoon of finely sliced rosemary, some olive oil and pepper and salt. BAKE the sweet potato for 15 minutes into the pre-heated oven. USE a vegetable peeler to slice off shivers parmesan cheese. 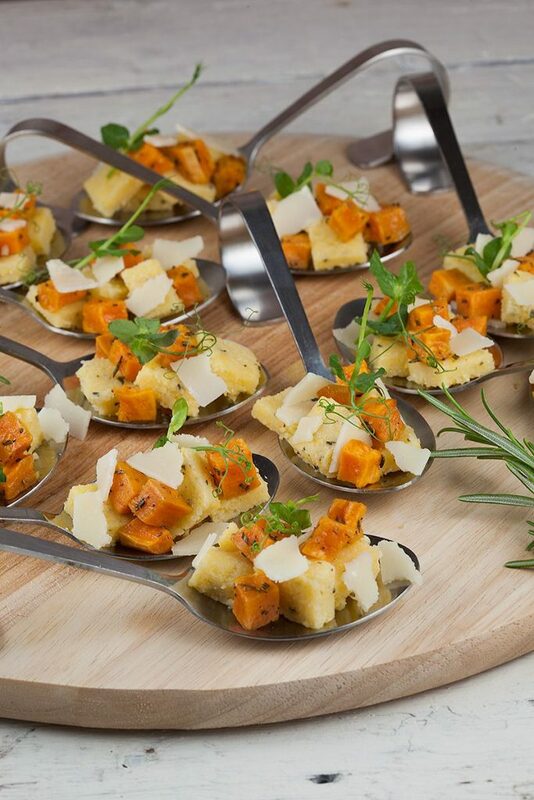 DIVIDE 2 -3 diced polenta and sweet potato over the tasting spoons. GARNISH with slivers of parmesan cheese and some rosemary. 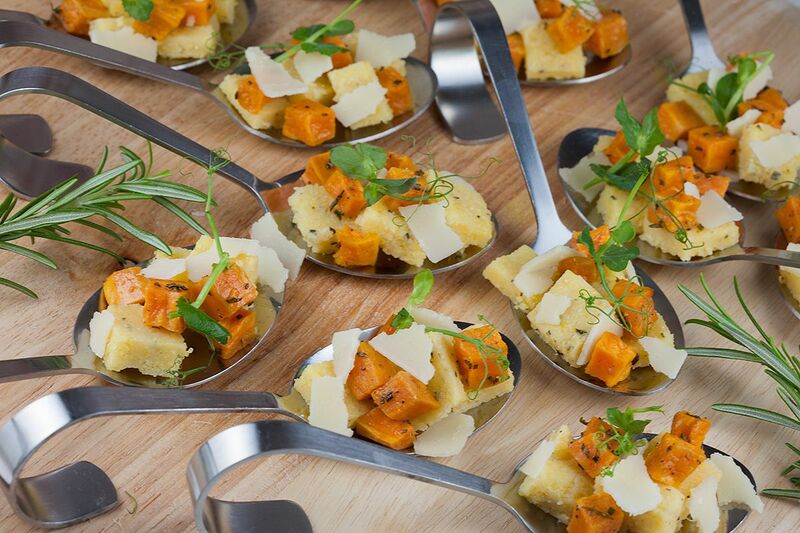 Enjoy these polenta and sweet potato appetizers!